Acxess Springs’s tools or applications which provide technology that improves the process of designing or manufacturing coil springs. Acxess Spring is known for its advancements in spring technology. We have made it much easier to design and shop for springs online thus saving you time and money. To design your springs, we have Spring Creator; a free, online spring calculator. To shop for your spring we have two options, stock and custom. For stock springs, we created Spring Finder; a search engine tool. For custom springs, we created Instant Spring Quote which, from its name, you can see that it instantly provides you with a spring quote to have your springs custom made. You can find both of these online shopping tools on Spring Creator. Spring Creator asks you to enter your spring’s physical dimensions in order to generate a spring design. With this information, it is able to calculate just about any information you may require to make sure the spring design will work. This includes spring rate, working loads, travel capacities, the amount of material needed to manufacture one spring and one thousand springs, as well as many more spring specifications. Besides that, it will also provide you with warnings and helpful tips on both the manufacturing capabilities and the functionality of your spring. Generate a live blueprint of your spring design in pdf format along with your spring’s full spring analysis, a custom quote, and stock spring suggestions. To generate an Instant Quote, you may also use Spring Creator. Since all of the spring specifications are available, Spring Creator is now able to automatically provide you with a quote as long as your spring is within the quoting parameters. This is for a limited time, we are working on the spring technology behind our instant quoting system to widen the quoting parameters so that you may get a quote on springs of all sizes, material types, etc. In the meantime, you’re able to get a quote on small/average sized springs between the minimum quantity of 25 pieces up to 25,000 pieces. If yo wish to place an order for a quantity larger than the 25,000 pieces or your design didn’t generate an instant quote, you may request a quote through our calculator as well. On the other hand, if you’re looking for a small order, you may go for the option of the stock springs. 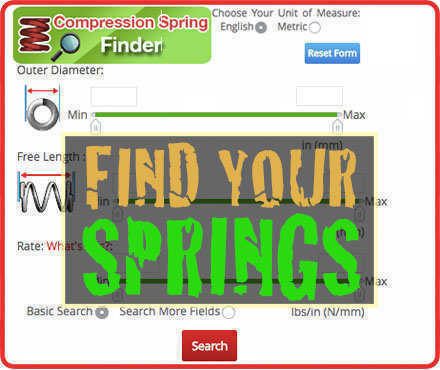 Because Spring Finder is a spring search engine which bases a spring search on physical dimensions and Spring Creator already has all of your spring dimensions, the spring technology behind this spring calculator allows it to automatically search our stock spring database to find similar springs in stock which may work for you. The search is based on outer diameter, length, and spring rate to make sure that, not only will it fit, but it will also have enough force to work as expected. You may also use Spring Finder directly through our online store, The Spring Store where you are able to widen the tolerances or be more specific about what you're looking for since the actual Spring Finder tool has a lot more fields which you can search for and you control the search ranges.